It’s time to give your favorite characters some love! Characters are essential to a story, and they can make or break a book for some readers. Now’s your chance to shine the spotlight on your favorite characters, or maybe your least favorite. I suppose this is obvious but I have to begin with Elizabeth Bennet from Pride and Prejudice. She is insightful, intelligent and so very funny. Her ability (and by extension, Austen’s) to make the polite backhanded compliment an insult is unparalleled. Whatever she is thinking, I’m sure it burns. Take that, creepy old lady! Next, I have to mention Sherlock Holmes and Dr. Watson. The two are so perfectly suited for one another. They illuminate each other’s strengths and weaknesses. They have tiffs, to be sure, but in the end they are best friends and would be lost without the other. As brilliant as Holmes is, he cannot (and often does not) function without Watson, his conscience. Watson, on the other hand, comes to realize his own intelligence by exercising it on cases with Holmes. The above books are ones that I read for the story as well as the characters. A series that I must admit I read firstly (and secondly) for the characters and the plot is just icing, are the Nero Wolfe books. Thankfully there are dozens of stories to read. Set mainly in the 1930s and 40s, Nero Wolfe is a curmudgeonly, portly detective who keeps court at his impressive brownstone on 35th Street in New York City. He never leaves the house, he has a live in chef, keeps an admired orchid collection in his rooftop greenhouse and loves the color yellow. His idiosyncrasies are many and thus he employs Archie Goodwin to handle the business side of things. 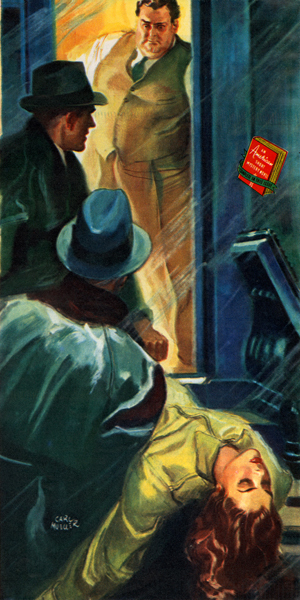 Archie gathers clues, witnesses and criminals by the fistful and brings them to Wolfe’s office. The books (and short stories) are written in Archie’s voice and they are hysterical. He is a smart aleck who loves to crack wise and get under Wolfe’s skin. At the same time, Wolfe would be stranded without his gumshoe, however annoying he may be. And he has to admit, Archie is good at it. There is also a television show starring Timothy Hutton and Maury Chaykin, entitled Nero Wolfe. It was very well made and true to the characters. Watching the two of them fume made for great TV. I also named my dog Archie.